Optimism reigned at the end of the two-day strategic planning session on this July 1985 evening in Pittsburgh. Halfway through the year, Westinghouse was on course to surpass the record profits it had earned just a year before, the first under the full tutelage of Chairman and CEO Douglas Danforth. But the tall, frank-speaking Danforth wasn't satisfied. As they sat in the Urban Room on the 17th floor at the Westin William Penn Hotel, the 60 top managers were implored to try harder. Westinghouse had to boost profit margins, had to get its stock price up, had to earn the respect it deserved from investors. Little mercy would be shown for operations that didn't stack up. As an added incentive, each man in the room was asked to reach under his chair and open the envelope taped on the bottom. Inside were the rewards they would divide if they met lofty performance targets -- rewards made all the sweeter by a stock incentive plan adopted in Danforth's first year in office. There was an unnerving quiet as the executives ran the numbers through their brains to determine their shares of the bounty. It was like a junior high algebra class in a race to see who gets the answer first. "Doug wasn't the first chief executive to appeal to greed," said one former manager who attended the meeting. Indeed, greed defined the times. Ronald Reagan, the champion of free markets and unbridled capitalism, had just entered his second term. Wall Street was in the early stages of an unprecedented bull run. And corporate raiders were held up as heroes -- cunning businessmen who were unleashing the competitive forces of a marketplace that for too long had tolerated slackers. If the men in the room needed further clues to what could befall their company, they could walk a block down Grant Street to Gulf's headquarters. There, Gulf was completing a sad exodus wrought by T. Boone Pickens. The Texas oilman had waged a long and hostile takeover battle and was on the verge of winning when Chevron stepped in to save -- but ultimately to dismantle -- Gulf. "Doug tried to convince anybody who would listen that you had to treat the company as if it were the raider or it wouldn't survive," the former manager said. From that perspective, it's hard to argue with the results. 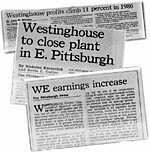 Over the course of Danforth's four years at the helm, Westinghouse profits soared, profit margins almost doubled, its stock price more than tripled and dividends were increased every year. The company even outperformed rival General Electric, the benchmark that drove many Westinghouse executives. Danforth was similarly successful outside the boardroom, leading a team of corporate executives that bought and preserved the Pirates baseball franchise in Pittsburgh. A mechanical engineer by training and a former GE executive, Danforth was a no-nonsense, results-driven man. As head of the Pirates group, he helped push the Galbreath family to accept a relatively low offer for the team. At Westinghouse, Danforth was equally demanding, shedding businesses that didn't stay on plan and executives who didn't measure up. Everything centered on raising Westinghouse's return-on-equity -- the ratio of profits to stockholder value -- to 20 percent, a margin enjoyed by only a handful of businesses. Danforth didn't have a lot of time. He would only be chairman four years before he had to retire at 65. He wanted to leave his mark on the company and among his fellow Fortune 500 chief executives. And make no mistake, this was Danforth's company. Unlike Donald Burnham, who remained a director after retirement, Robert Kirby was kept off the board after he retired, despite his desire to stay. In case the message wasn't clear enough, the 1983 annual shareholders report drove the point home. Although Kirby didn't step down until December of that year, he wasn't mentioned until Page 45 of the 48-page publication. "What came out of the Danforth era was this sort of short-term management culture," a former Westinghouse finance executive said. "It's always a delicate balance, doing what's good for the company today and what's good for it five years from now. But the message was, 'You do whatever it takes to meet the quarterly projections.' That also was reflected in the pay schemes." Those schemes included an incentive plan for senior managers approved by the board in 1984 and modeled after a similar plan at H.J. Heinz Co., where Westinghouse director Burt Gookin had been vice chairman. Only, Westinghouse's plan was a poor man's version of the Heinz plan; it wasn't loaded with nearly as many stock options. Still, the new plan resulted in sizable pay increases for managers who performed well. In his four years at the top, Danforth's total annual payout -- including the exercise of stock options -- jumped from $858,000 to $4 million. Instead of expanding into new, potentially high-growth businesses, Danforth spent more than $1 billion buying back stock. Shares outstanding fell by almost 20 percent during his tenure. There were scores of small, strategic acquisitions, but no blockbuster deals. One heralded acquisition ended up a bust -- the $107 million purchase of Unimation, a robotics company. That actually occurred late in Kirby's tenure, but was pushed by Danforth to make Westinghouse a big player in industrial robots. The only problem was that Unimation's hydraulic technology was outdated. The market was moving to electric robots. It didn't help that a major Unimation customer, General Motors, went into the business on its own a half-year after the transaction closed, or that much of its talented staff left after the sale. The venture that was supposed to make Westinghouse a leader in factory automation withered away. "You never hit all home runs," Danforth says. One reason the company was quiet on the acquisition front during the Danforth years was Vabastram, the mathematical strategic planning tool. It rarely saw a deal it liked. That didn't stop some from being made -- acquisitions Teleprompter and Unimation had failed to meet Vabastram's muster -- but it inhibited hot pursuit of many potential partners. While Vabastram discouraged acquisitions, it encouraged divestitures, a feature that wasn't lost on Danforth. During his reign, Westinghouse would dump businesses with a combined $1.3 billion in annual sales. His biggest divestiture still rankles many former executives. Four years after Kirby bought Teleprompter, Danforth sold the cable operation to a consortium of competitors for almost $2 billion. Danforth still cites a number of reasons for the sale: the cable operations weren't making the kind of profits that were expected; cable was under pressure from regulators and competitors; there was a potentially severe threat from budding direct satellite TV technology; and the price was right. It was certainly right for Danforth. He needed a big gain to offset the write-down of nearly $1 billion of closed factories and discontinued ventures -- moves that would help shrink Westinghouse's work force by 23,000 during his tenure -- and the $651 million pretax gain from cable's sale gave him that. It also freed up another $1 billion for the repurchase of 35 million shares, giving the company's stock and per-share results an upward jolt. Although cable's sale could be justified by the numbers -- strategic planner Don Povejsil and his Vabastram model gave the sale a big thumbs up -- many of Danforth's contemporaries feel he betrayed Kirby's vision. Cable and broadcasting were among the few units that showed promise for fast growth, but he abandoned them. Another division that showed potential was the financial subsidiary. Unfortunately, while broadcasting threw off cash, the financial subsidiary devoured it. Virtually all the cash generated by Westinghouse Financial Services and its principal subsidiary, Westinghouse Credit, was plowed back into new loans. Had cable been around, many believe, it could have generated enough cash to carry the financial unit through the coming storm. Before he left office, Danforth had one more job to do: choose a successor. It wasn't going to be easy. Several candidates groomed by Kirby were gone. Gordon Hurlbert left after Danforth became chairman. Daniel Ritchie exited with the exodus of Group W Cable. Edwin Clarke had been nudged aside in a management reorganization that gave John Marous oversight of the industries group. Leo Yochum was still around, but as a finance man in a company managed by engineers, he was a dark horse at best. There were some new faces, including Paul Lego, a bright engineer who'd done a good job for Danforth when Danforth ran the industries group. Danforth brought Lego into his inner circle, as head of corporate resources. But Lego was green -- he'd never run a major operations group. And he lacked people skills. He wasn't good at small talk. A quantitative thinker, he could come across as arrogant and condescending, belittling those slow to catch on or unable to see things his way. To the outside world, the choice boiled down to Thomas Murrin or Marous, with Murrin the most likely winner. But at headquarters, it was viewed as a toss-up. Murrin and Danforth were like oil and water. Danforth was a soft-spoken, but somewhat rigid, by-the-books leader. He didn't like it when his managers strayed from the path. And everything about Danforth was about maximizing profits, from the corporation to his personal life. 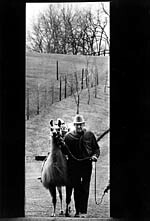 He was a shrewd real estate investor and raised llamas and Christmas trees on his Washington County farm not just as a hobby, but for money. Customers who liked haggling over the price of a tree -- a tradition for many -- would find there was no haggle with Danforth. It was $26, firm. He even was fanatical about saving all his sales receipts to ensure he got all the deductions due him at tax time. Murrin, on the other hand, was a backslapper. He didn't much care for financial details. If he had a question or needed to figure out a way to make the numbers work, he'd go to Leo Yochum. His forte was manufacturing. He often would break into a long discourse about the wonders of Japanese manufacturing and what Westinghouse could learn from it. And Murrin, who grew up in New York City, relished mixing it up with his troops. He made a point of knowing their goals so that he could help them achieve them, and would work behind the scenes to move them along in their careers. His loyalty was rewarded in kind -- his underlings would bust their butts for him. Marous, a North Side native and son of working-class parents, was a baseball star at Perry High School and a University of Pittsburgh engineering graduate. He'd risen through the ranks to become a top executive at his hometown's largest and, in many ways, most prestigious employer. On paper, Marous looked good. He was an eight-year veteran of the management committee, which was composed of the chairman and the operating group heads who run the company. He had headed international since 1979 and, for the last three years, also oversaw industries, a period when it turned around dramatically as Marous and Lego sold or closed marginal businesses and outdated plants. But Marous rubbed many of his peers the wrong way. He was considered a tremendous salesman and marketer -- "He could make you believe ice wouldn't melt in South America," laughs one former chairman -- who had climbed as high as he had in part by cultivating his superiors. And Marous had cultivated Danforth for some time. At executive retreats, where top managers would discuss strategy and review operations, Marous and Danforth would break off from the pack when it came time for cocktails. The rest of the senior managers would hang with Murrin, drinking and talking into the wee hours. Danforth called the group "Murrin's Court." Danforth's and Marous' spouses were friendly, and the four would travel together. One trip, in the summer of 1987, is still known as Danforth's "Farewell Tour." Just before his successor was to be chosen, Danforth, Marous and their wives, Janet and Lucine, went around the world to visit Westinghouse facilities. Both Danforth and Marous insist it was a working trip, a traditional last-time-around jaunt for an outgoing chairman. But that's not how it played among the troops. Still, Danforth knew if he settled on Marous, there'd be problems. Several top executives had made it clear they would not stick around. And Marous was almost 62, near retirement age. One of Danforth's biggest regrets is he only had four years at the helm -- not enough time to truly shape a corporation where he had spent so much of his life. Late in the spring of 1987, Danforth recommended Lego, who was then 57, to the board. Marous signed his resignation papers and told a few associates he was retiring. But the board, while packed with Danforth allies, was uncomfortable. It felt Lego needed seasoning. A compromise was struck. It would be Marous for two years, to be succeeded by Lego, who would serve as president until then. Wall Street applauded the move as sensible, but on the 23rd floor of the Westinghouse Building, the storm hit. Despite pleas from Danforth, Yochum wouldn't work for Marous. Douglas Stark, head of the commercial group and a close associate of Danforth's, also left. As, of course, did Murrin. And in a few months, John McClester, the longtime head of the company's financial services subsidiary, would retire. Combined with the earlier defections of Ritchie, Clarke and Hurlbert, it was a brain and leadership drain that would reverberate throughout the corporation.